We pass a number of fanciful towns and hamlets. Recently we've come through Hayter's Gap, Haysi, Pippa Passes, and even upcoming Krypton, Kentucky looms. However Dwarf, Kentucky has be on anyone's short list (tee hee hee) of great names. It's really just a tiny burg with a post office, fire department, and a few buildings. The community board is up but still advertises the Dwarf 2012 Reunion. Bree our waitress made a nice smiley face of pineapple and strawberries with my cottage cheese. Here we have the accent, but Bree's Kentucky drawl is infectious but difficult to understand. Our table asked several times what kind of pie, and she kept repeating the answer until I told them it wasn't Kentucky Seal but Kentucky Silk. I asked her for water in my bottle and she kindly asked if I wanted “ahss” in it. 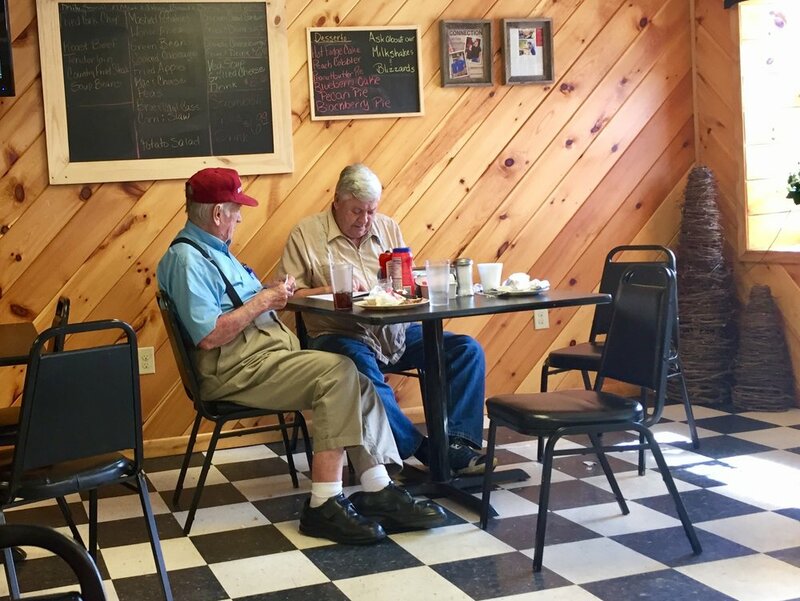 At 97 years old, Booneville Mayor Charles Long is the oldest serving Mayor in the United States. He may also be the longest serving Mayor as well, having first been elected in 1959 back when Dwight D. Eisenhower was President and Fidel Castro had just taken power in Cuba. He has never had a contested race for re-election. “When I was elected we didn't have sidewalks. No pavement on the streets - just dirt. If you wanted to go to Jackson you had to ford the river. When I got on the town board in 1954 the city had a wheelbarrow, some shovels and axes for road maintenance. Now I have city water and sewage into 96% of the county. The city - if you can call it that - has 81 residents according to the 2010 Census has seen a lot of changes. "I've never lived anywhere else (other than a stint in the Philippines with the Navy during World War II) and I just loved the people.” He was married to his wife 72 years. She passed way in 2012. Tonight we are staying at Booneville Methodist Church Life Center. It's a lovely night and the sunset lots up the sky all around us in a gauzy pink, blue and orange. One other noticeable difference in Kentucky. The convenience stores have a bewildering supply of tobacco including massive bags of pipe tobacco.